On 4 December 2000, the UN General Assembly adopted resolution 55/76 where it was noted that June 20 would be observed as Refugee Day. The event is observed all over the world, to honor the plight and sufferings of a refugee. In the words of UN Secretary General Ban Ki- Mon, “World Refugee Day is a moment to remember all those affected, and a time to intensify our support. “ Various activities and events are organized throughout the world by UNHCR and also NGO’s to mark this day. To commemorate this day, Tamil Solidarity Malaysia decided to show its support and address the issues faced by the refugees in Malaysia. In accordance with the theme of 2012 refugee day : Refugees have no choice. You Do, Tamil Solidarity decided to hand in a memo to UNHCR Malaysia, to highlight the various problems being faced by asylum seekers and refugees in Malaysia with the UNHCR office in Malaysia. UNHCR agency is mandated to protect refugees and resolve refugees problem, however based on the experience of refugees and asylum seekers in Malaysia, it is evident that the agency has failed to uphold its mandate. To address this issue Tamil Solidarity Malaysia met up with almost all refugee community organizations and identified the problems they face when they approached the UNHCR office. Tamil Solidarity came up with a memo entitled “ The right of person of concern and refugees to have fair efficient and dignified asylum seeking procedure and expeditious assistance when in detention,” with 9 point demand. Among the main demands to UNHCR Malaysia in the memo were humane treatment of asylum seekers and refugees by UNHCR staff; efficient emergency hotline providing aid in case of wrongful detention of refugees by local authorities; informing refugees with medical needs or certain disabilities where and how to avail themselves of financial or medical assistance; refugees to be informed of any educational opportunities for their children; asylum seekers to be interviewed in a professional manner and provided relevant documents; using only trained and professional interpreters throughout all application processes; waiting areas to be protected from the elements; and their interviews should not be rescheduled many times without proper documentations. 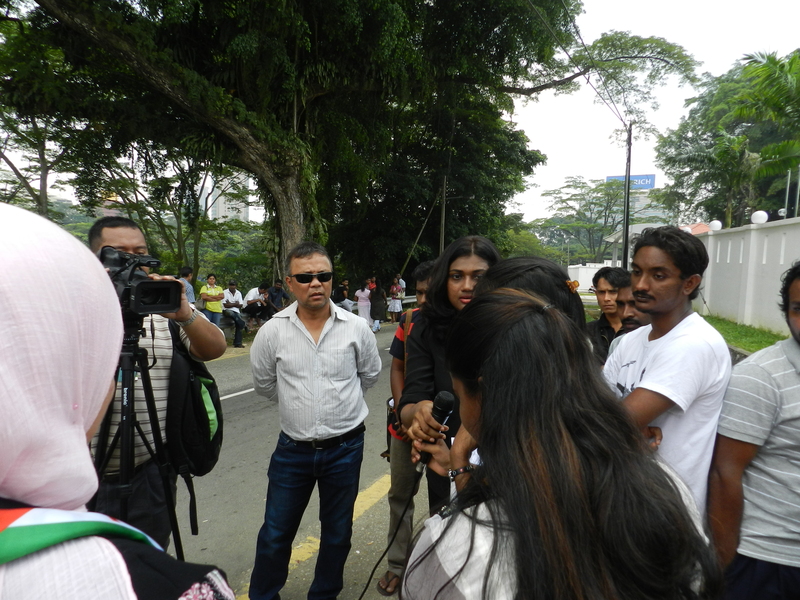 Tamil Solidarity Malaysia together with 50 refugees went to the UNHCR office on 20th June 2012 to present the memorandum to the representative of UNHCR in Malaysia. 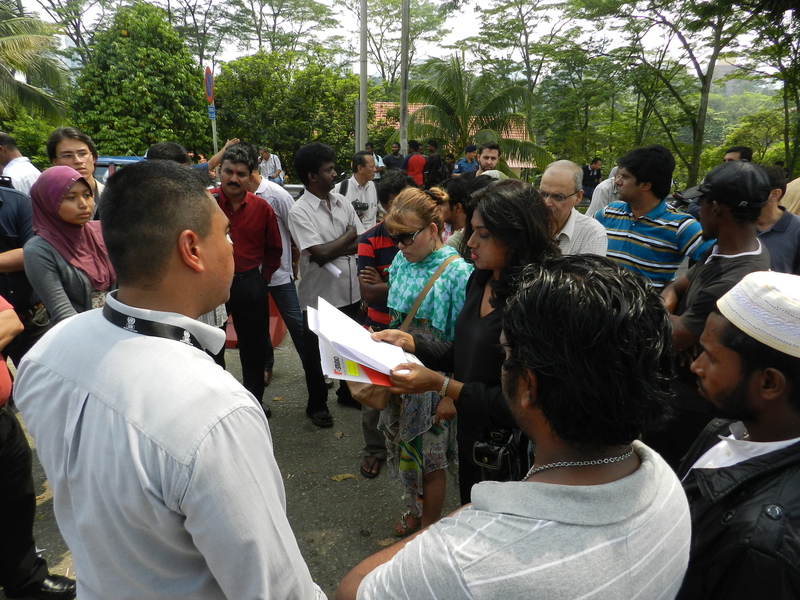 However Tamil Solidarity, was denied audience with the representative of UNHCR Malaysia. Instead only a security personnel was sent to deal with the representative of Tamil Solidarity. Tamil Solidarity representative Maha, tried to negotiate with the security officer to get the memo acknowledged by the representative but however it was of to no avail. The security officer however agreed to accept the memo and agreed to pass it to the representative. Tamil Solidarity, then had press conferences at the compound outside the UNHCR office Malaysia, and highlighted the contents of the memo and the issues faced by refugee community with the UNHCR office in Malaysia. The refusal of the representative of UNHCR Malaysia to give audience to Tamil Solidarity Malaysia’s representative, shows utter disrespect of the office to the plight of the refugees. However, Tamil Solidarity Malaysia will continue to campaign for better conditions for all refugee communities and push for a solution as the Malaysian govt has not ratified the The Refugee Convention 1951, and so the UNHCR agency in Malaysia has a very important role to protect refugees compared to other UNHCR agencies in other countries that are signatories to the 1951 Refugee Convention. In the future, Tamil Solidarity will also be campaigning for education and charity for Eelam refugees as refugees cannot legally work in Malaysia and refugee children are only allowed to go to private schools and most refugees cannot afford private school tuition for their children. Some of the other refugee communities in Malaysia have well organised organisations that help them in this aspect and the Eelam refugees need such organisation.